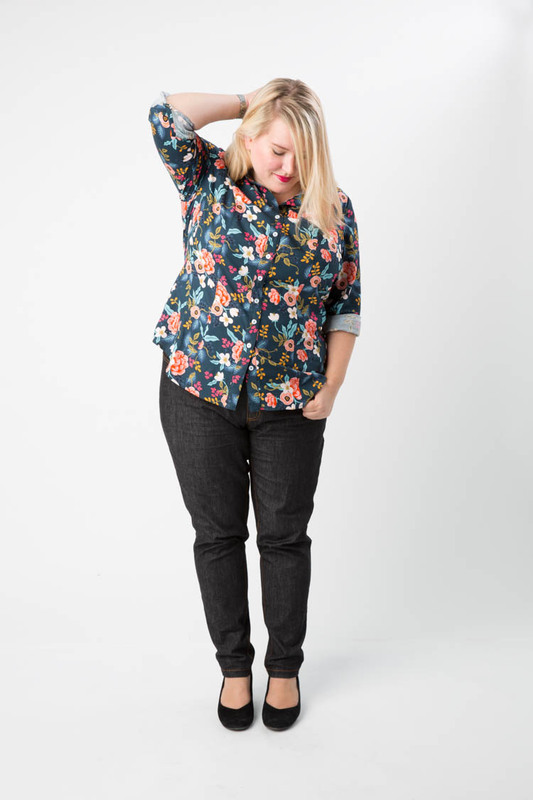 The #1 request ever since I launched Cashmerette Patterns has been the holy grail for curvy ladies everywhere: a non-gaping, non-tenting button-down shirt. 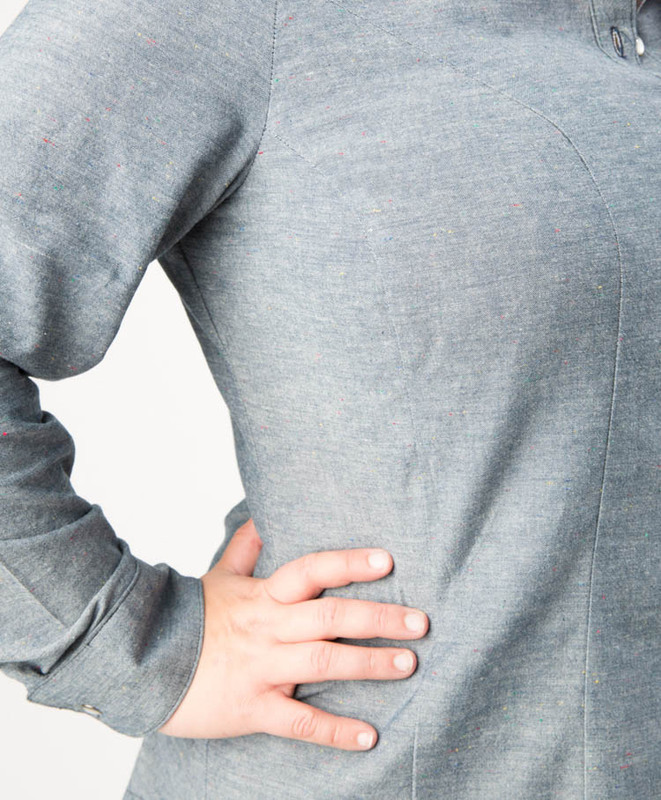 It took over a year of development and testing, but today I’m super proud to introduce you to the Harrison Shirt, the first shirt sewing pattern that doesn’t gape over curves! 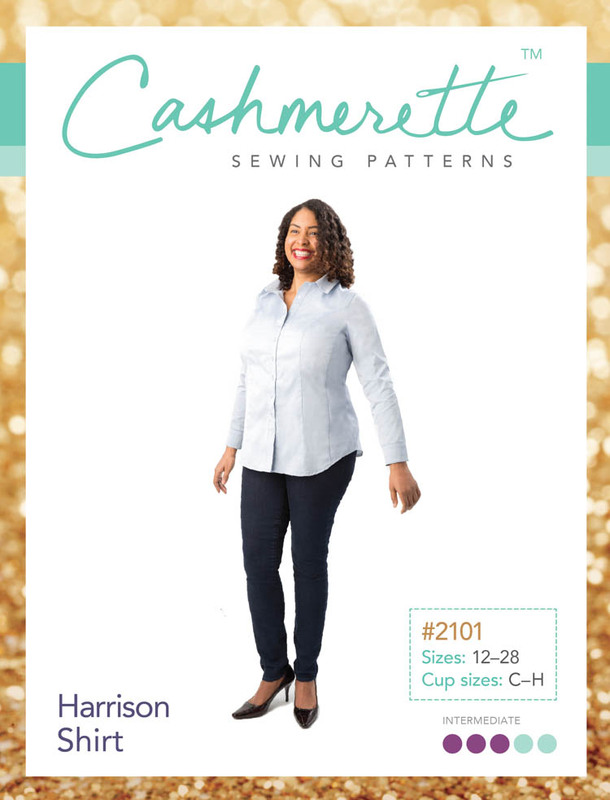 And not only that, but in addition to the pattern and Harrison kits, I’m launching the first Cashmerette online workshop: Shirt Making For Curves, with 10% off (ends Sep 17th). It’s perfect for first-time shirt makers, or if you want to brush up on your techniques – read on for more details! I wanted to design a classic shirt with traditional tailored features, that would also fit very well through the bust – until now, an almost impossible thing to find! The secret to the fit is the double princess seams in the front, which distribute the bust ease more gently than a traditional single princess seam, providing enough room for a full bust, and then pulling back in underneath, avoiding tenting. There’s a nice amount of ease through the waist to give a comfortable fit, but the double princess seams give you lots of potential for further fitting if you so desire! A traditional two piece collar, with a great construction method that will give you neat results every time. Two piece sleeve tower plackets, which are easy to sew and give you the fun option of having a ‘secret’ contrast under-placket. A two piece yoke, constructed with the burrito method for a totally clean finish inside. Back princess seams with a built-in sway back adjustment. A clean finish at the button band/hem. 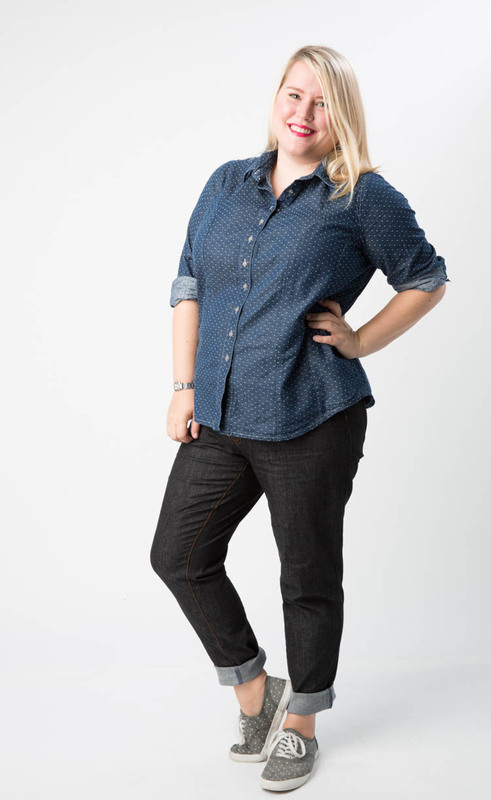 And, like all Cashmerette Patterns, it comes in sizes 12 – 28 and cup sizes C – H, so no more Full Bust Adjustments! The Harrison can be made out of a range of light- to mid-weight woven or stretch woven fabrics, including cotton lawn, voile, chambray, rayon, seersucker, linen or silk. Depending on how much drape your fabric has, you can have a crisp shirt for work, or a relaxed, flowy blouse. It’s classified as “intermediate” because there are quite a lot of steps involved in constructing a shirt, and some of the techniques are a little more advanced, like making buttonholes and constructing sleeve plackets. However, adventurous beginners could totally give this a go, as the comprehensive instructions, and online video class (see below!) provide lots of guidance for the first-time shirt maker. In fact, one of my testers made the Harrison as her third ever sewn garment and it looked fab! The Harrison Shirt is available in two formats. You can buy a beautifully printed paper pattern, which can be mailed to you anywhere in the world for under $8 (US postage is under $1.75), or you can pick one up at one of our worldwide stockists. Or, you can buy an instant-gratification downloadable PDF which will be delivered to your email inbox. You can print and assemble it at home, or you can take it to a print shop to be printed on large paper – there are versions included both for US copy shops (like Staples or Kinkos) which print on 36″ wide paper, and for international copy shops which print on A0. 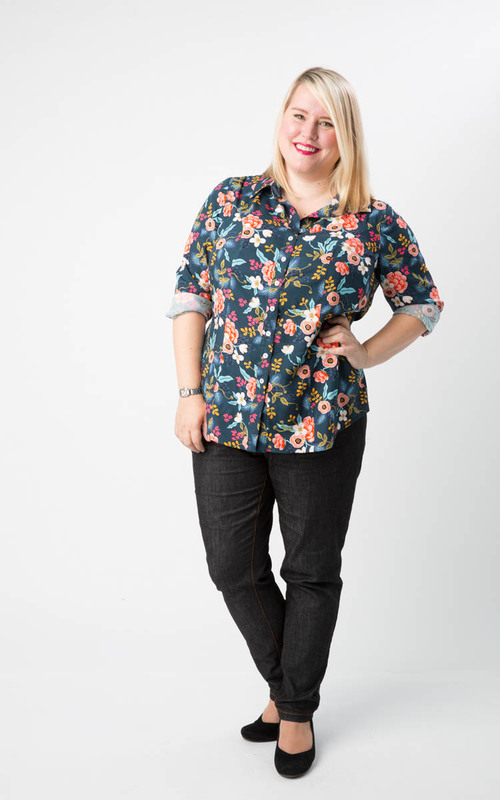 Making a shirt can be a bit intimidating, so in addition to launching the pattern today, I’m thrilled to also be announcing the first ever Cashmerette online workshop, “Shirt Making For Curves“. This 15 part, 3.5 hour online class takes you through every stage of the shirt-making process, and goes way beyond the instruction booklet, with tons of advice, tips and techniques for getting a professional-level shirt. It’s aimed at sewists who have a little bit of experience but haven’t tackled a shirt project yet, or those who want to take their skills up a notch! As it’s online you can join me for a workshop wherever you live in the world, and learn from the comfort of your own home – there’s unlimited access so you can watch it at your own pace, and repeat to your heart’s desire. Plus, a free copy of the PDF or paper pattern is included in the price of the course (an additional shipping charge applies for the paper pattern). And, if you register now (until Sep 17th), you can get 10% off! Just click on the link and the discount will be automatically applied. Last, but by no means least, KITS! 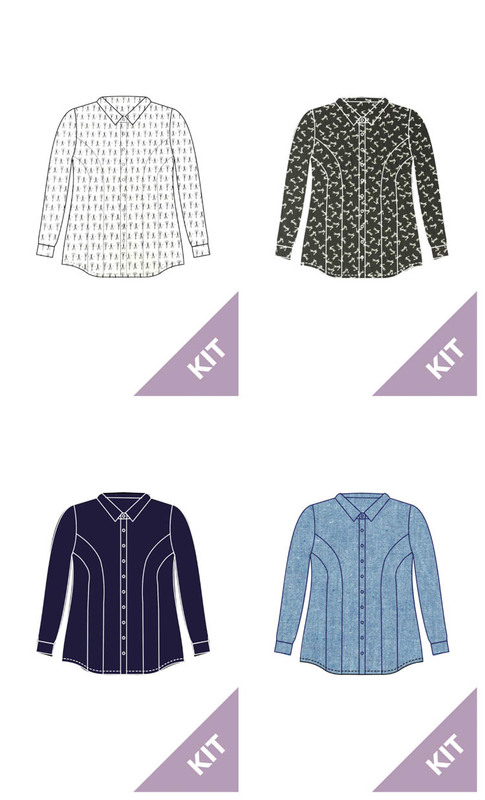 These Harrison Shirt kits contain everything you need to make your new favorite shirt: 3.25 yards of fabric, just the right amount of quality interfacing, and 12 matching buttons. They’re available bundled together with the printed pattern, PDF pattern, or just the fabric & notions (good if you’re buying the class, too!) – just choose from the drop-down box in the store. Clockwise from top left we have a white and black scissors print, a black and white hares print (bunnies! 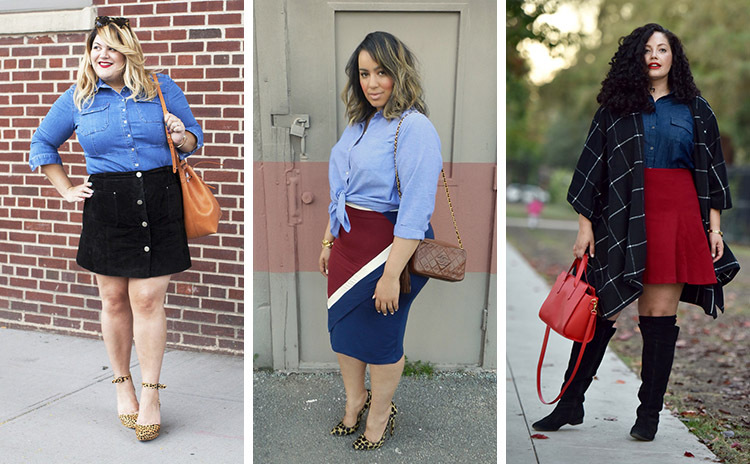 ), a sophisticated chambray, and a classic navy. Phew! So much excitement today. I really hope you enjoy the Harrison Shirt – I never thought of myself much as a shirt kind of gal, but once I started making them I realised that was just because I’d never worn one that fit me before! Now, I’m a total convert, and dreaming up lots of fabric and outfit ideas. Tell me, are you excited to sew the Harrison? And what fabric are you going to use first? It’s the Cashmerette Patterns 1st Birthday Sale! Love this! Looking forward to this pattern! Thank you for this! I have been wanting something like this for ages, as it’s impossible to buy a shirt in the shops that actually fits a large bust. Glad you’re excited, Betty! It could be adapted to being sleeveless, but the armhole would need to change in shape to work, so it’s not as simple as just leaving the sleeves off. 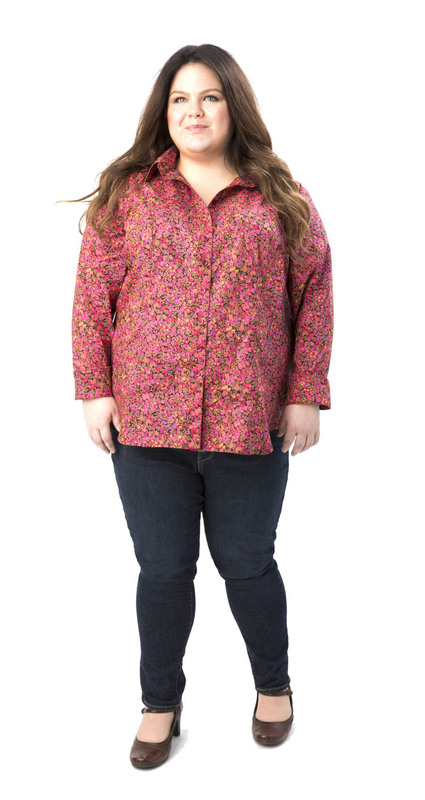 After testing a button down last week, I was thinking, I wonder when Jenny will release a button down? Because that would be awesome. And lo and behold, this dropped in my mailbox over the weekend. Can’t wait for pay day now to get in on this action. Glad that it arrived at just the right time! Looks great, lovely shirts, will definitely be buying this one! Wow, looks so great. Can’t wait to try it. What a great job you have done here. I can’t wait to get this! So excited. Gah! Please consider going down just one more size! I’d love to avoid the ginormo-FBA but would have to downgrade. Is this feasible? Could you do a tutorial on downgrading for those of us who are petite but take a G cup in ‘standard’? I’ve been playing with the Granville for more muslins than I can remember, and moving my honkin’ dart all over the place, would be so lovely to have that done professionally! Ooooo! Thank you, that’s sneaky but I like it! I do have narrow shoulders though, how do you calculate your bust sizes? I’m assuming a C/D cup would be 3-4 inches larger than overbust? I always wanted a button down shirt. I’m going to get this pattern for sure. Oh my goodness this is a beautiful pattern! It looks amazing on you! I am so excited to see this pattern (have already bought it), it looks amazing on all of you. It will be wonderful not to worry about an FBA, and to get a great fit. Can’t wait to get my hands on it, hurry up Mr postman! I really like the double princess seams! There is potential for colour blocking! WOW! Wow wow wow!!! I cannot WAIT to make this shirt! I have muslined button down shirts to DEATH, and in the end just gave up. My next step was to create a pattern from a shirt I already own that fits, but this will be even easier. Thank you, Jenny!!! The double princess seams are brilliant!!! Thank you so much for creating this pattern. For those of you who are beginners: I learned to sew by making a men’s button down shirt in chambray. It’s a lot of steps, but it’s just straight stitches. (well, plus buttonholes). Be sure to PRESS each seam as you sew. That’s what gives the best results. I can’t wait to get started on this shirt! ooh, I just can’t wait to be making that one, it’s just gorgeous, and on top of the partical side, the double princess seams gives it such a unique look! THRILLED!!!! Holy grail indeed! Still deciding what format to order, but can’t wait. The middle princess seam (nearest the button band) goes over the bust apex . You’re probably best off making a Muslin first, and then you can pin the princess seams into the best shape for you! Thanks Jenny – I signed up for your video class and ordered my free pattern through that. SOOOO excited! I’m over the moon with excitement as my pattern and navy shirt kit arrived yesterday. The material is gorgeous and I don’t know that I would have picked this fabric. Now that I see it, I’m in love. It will be quite the beauty. What kind of thread do you recommend? Where I gather with others, they all rave about Aurfill but since they are quilters I didn’t know if that will applicable to garments. While I’m slow and usually find I rip out and resew as much as I get done….I will be thrilled to post pictures of my progress. Yay!!! 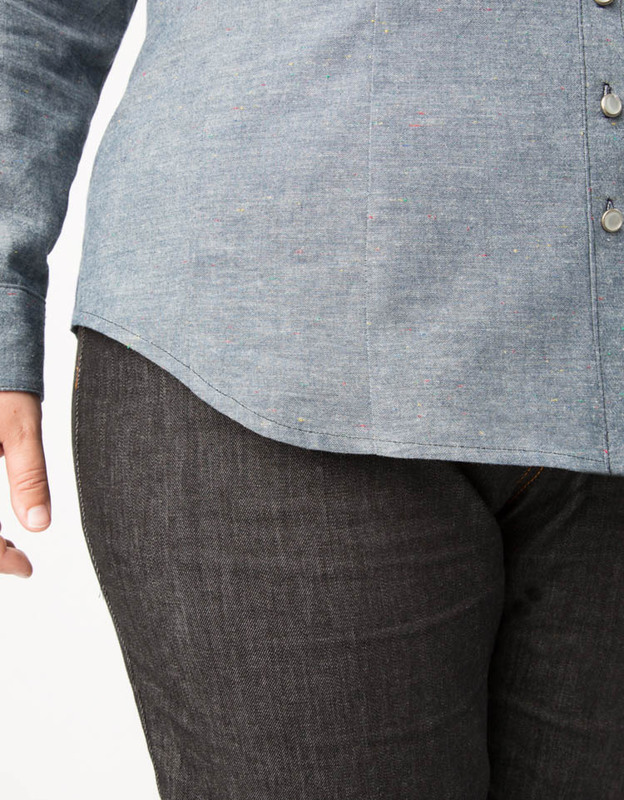 Finally a curvy fitted shirt pattern! I’ve made a bunch of Archer shirts but they’re too boxy for work. 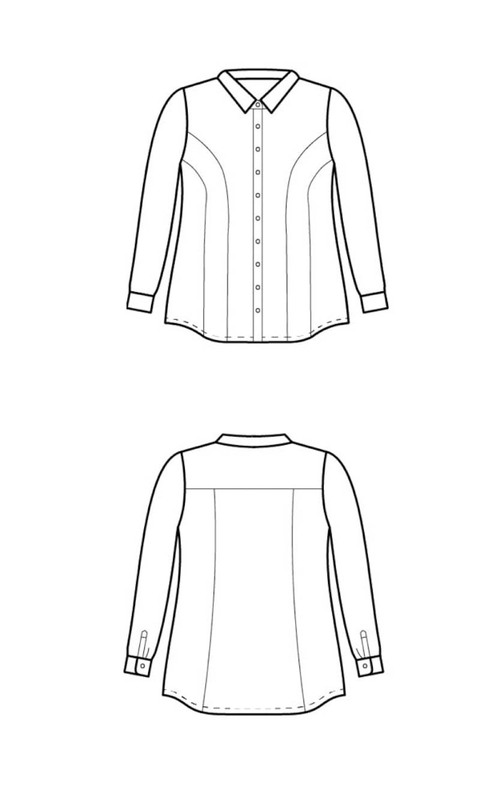 Was toying with the idea of trying a Granville shirt but grading up plus an fba on princess seams – ugh. Can’t wait to get started on this! I was curious how to determine the cup size with your patterns? I have a 10″ between my full and underbust. You use your full bust measurement to choose your cup size.